In the 1920’s, Charles Ponzi came up with the scheme that bears his name. He would guarantee investors a 50% profit in 45 days. Charles claimed he would buy discounted US postal products in foreign countries, and then redeem them in the US for full price. Actually, Charles was just taking the money from second tier investors, and giving most of it to the first tier investors. The first tier investors would tell others about the great return they received on their money, in 45 days, and soon others would join in a new tier. A day doesn’t go buy that some ill-informed reporter doesn’t call Bitcoin a Ponzi scheme. If Bitcoin was a Ponzi scheme, it would mean early adopters and creators would be reaping the rewards of the latest Bitcoin holders. That is simply not the case with Bitcoin. Three months ago, a friend of mine was fighting for an MMA title. The odds against him were 8:1. For every dollar I bet, I would win eight. I couldn’t make it to Las Vegas in time to place the bet, so I had to do it online. Luckily, the most popular online gambling site, in the world, was running a 100% deposit bonus for first time customers. I deposited $200 with my Visa, and had another $200 bonus added to my account. Unfortunately, 24 hours later, Visa declined the payment. In a bind, I had to go to the drug store, buy a pre-paid credit card(which cost $20 for the initial purchase) and pay with that. On top of the initial card fee, there was a $2.00 per month service fee, and .25c per transaction fee. Contrast that to the meal I purchased this week at a local bar. I had about $60 in Bitcoin on my phone’s wallet for the $45 meal. The waitress gave me the bars’ wallet address on a qr-code post-it and I paid within seconds. 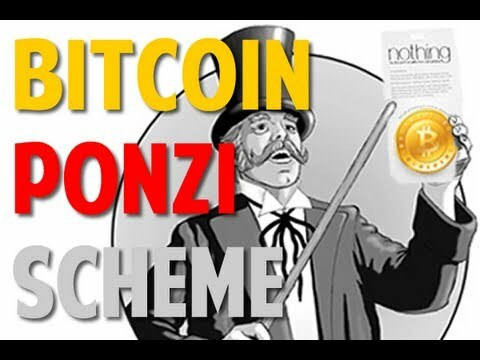 Please explain to me where the Ponzi scheme is? I didn’t have to pay a $20 fee to get the wallet. I didn’t have to pay a transaction fee. The restaurant only paid a 1% fee to immediately convert the Bitcoin to cash, and all parties involved came out ahead. Bitcoin might just be the opposite of a Ponzi scheme, more like Fonzi. Oh yeah, my buddy lost the fight, and I was out $200. But, I could have won $3200. I wonder if MMA is a Ponzi scheme?